Washington's 1st congressional district encompasses the majority of Whatcom, Skagit, and Snohomish counties, as well as nearly one-third of King County. The eastern edge of the district follows county lines from the Canada–US border down to the I-90 corridor. Then it follows I-90 west to West Lake Sammamish, and from there north to I-5. The western border follows the I-5 corridor north to Bellingham, then along the coast to Canada. The 2012 redistricting drastically changed the 1st district. Much of this area was previously part of the 2nd district, but in the new map the 2nd has shrunk significantly. Jay Inslee (D) was the representative of the 1st District until resigning to run for Governor of the state, but most of the district has been represented by Rick Larsen (D), of the 2nd District, in the past. Soon after the 2012 general election polls closed, the Seattle Times and national news organizations called the district for Democrat Suzan DelBene, defeating Republican John Koster with a margin that the Seattle Times called "unexpectedly decisive", reflecting the difficulty of predicting the vote in the new district. The certified results confirmed her significant margin. DelBene also won the election for the remainder of Inslee's term in the old First District, and after being sworn in on November 13, 2012, is serving in the 112th Congress. In presidential elections, the 1st District has leaned Democratic. Under the old boundaries, Al Gore and John Kerry narrowly carried the district in 2000 and 2004 with 48% and 51% of the vote, respectively. In 2008, Barack Obama swept the district with 55.60% of the vote while John McCain received 42%. 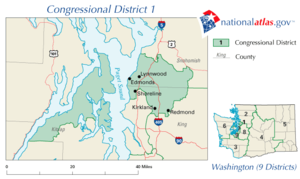 Prior to the 2012 redistricting, the district encompassed part of Northwest Seattle and largely suburban areas north and east of Seattle including Shoreline, Edmonds, Lynnwood, Mountlake Terrace, Kenmore, Bothell, Kirkland and Redmond as well as Bainbridge Island and part of the Kitsap Peninsula. Until March 20, 2012, it was represented by Democrat Jay Inslee from Bainbridge Island. Inslee resigned to focus on his run for Governor of the state; the seat remained vacant until the special election that coincided with the November 2012 general election. The former House seat of powerful U.S. Senator Warren G. Magnuson, the district was a swing district throughout much of the 1990s, changing hands and parties three times in four elections. Before the election of future U.S. Senator Maria Cantwell in 1992, the district had been in Republican hands for 40 years (and 42 of the previous 46 years). Since the 1998 election, when Inslee was first elected, the growing Democratic trend in the Seattle area enabled him to turn it into a fairly safe seat. He had been reelected six times with little difficulty, most recently in 2010. March 3, 1917 Redistricted from the at-large district. March 3, 1931 Lost renomination. March 3, 1933 Lost renomination. January 3, 1947 Lost re-election. January 3, 1949 Lost re-election. Retired to run for Governor of Washington. January 3, 1973 Elected in 1952. January 3, 1995 Elected in 1992. January 3, 1999 Elected in 1994. March 20, 2012 Elected in 1998. Resigned to run for Governor of Washington. ^ "Federal - All Results". Washington Secretary of State Sam Reed. Retrieved 10 December 2012. ^ "November 4, 2014 General Election Results". Washington Secretary of State. November 4, 2014. Retrieved January 8, 2015. ^ "November 8, 2016 General Election Results". Washington Secretary of State. November 8, 2016. Retrieved June 2, 2017.